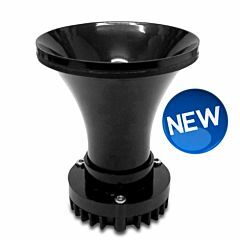 50 watts high power directional horn with neodymium magnet. Suitable for all the types of song. This new horn offers the possibility of to change the diffusers, so?, to be able to reproduce every sonorous frequency in perfect way. Without cone for song thrush, sky lark, lapwing, starling etc. Small cone for ducks, quails, and goose. Great cone to call geese and ducks from great distance.